11.08.2018: - But First, Tag Focuses on Defending Trois-Rivières Title Alex Tagliani is going to be a busy man this weekend in Trois-Rivières where he is ready to defend his NASCAR Pinty's race champion title. Alex Tagliani is going to be a busy man this weekend in Trois-Rivières where he is ready to defend his NASCAR Pinty's race champion title. Busy, because besides his on-track duties, the Canadian Motorsports Hall of Fame inductee will also entertain race fans at the RONA booth located inside the Grand Prix paddock to talk about the new RONA Contactors Division sponsorship which will grace his Chevrolet Silverado at the upcoming August 25-26 NASCAR Truck Series race at Canadian Tire Motorsport Park (CTMP). Alex invites all race fans attending the Grand Prix this weekend to stop by the RONA booth to meet him and chat about Sunday's NASCAR Pinty's race and his chances for a repeat win. He will also entertain fans and share his thoughts on his next project - driving his RONA Contractors sponsored Chevrolet Silverado in the NASCAR Camping World Truck Series race scheduled to run on August 26. "It is also exciting to represent RONA, this time through their Contractors Division, in this very important NASCAR truck race coming up in two weeks," continued Tagliani. 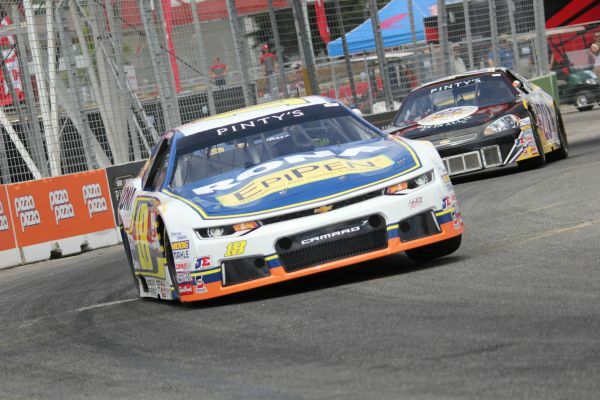 "I will be heading to the Canadian Tire Motorsport Park road course to win in both the NASCAR Pinty's and the NASCAR Camping World Truck Series races. Because we made an early deal with team Young's Motorsports, we will be more than ready this time around. All that matters is that I win for RONA and all my other sponsors. During his 2018 season, Alex Tagliani will race across Canada promoting the fifth annual Summer of TAG which raises awareness about food allergies and the importance of educating those afflicted, with the Allergy-Friendly Kitchen Contest: a program for learning how to cook safely and minimize the risk of cross-contamination. For more information on Alex Tagliani, please visit www.tagliani.com, follow him on Twitter at @tagliani, @tagliani18 on Instagram and like him on Facebook at www.facebook.com/Tagliani.